A High Frequency Simulation Table (also known as a Multi-Axis Shaker Table or MAST) is a dynamic system designed to perform research and development tests. It requires an appropriate configuration, coupled with a Test Controller and features a state-of-the-art digital architecture using the latest hardware and software. A customer does not just order a Hydraulic Simulation Table, but rather a solution to match defined objectives within very specific characteristics. 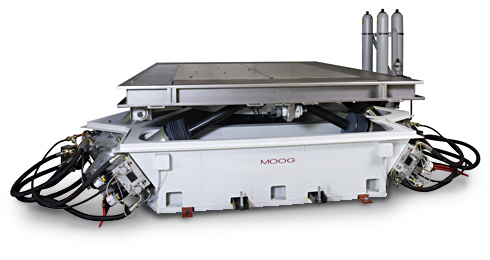 These characteristics can be so diverse that sometimes Moog has to push the limits of what has been done before with hydraulic, electric and mechanical specifications. Our experts ensure that each solution is technically achievable and matches customer expectations. It is standard in the industry to reach 50 Hz with 6 Degrees of Freedom (DOF) hydraulic solutions, but it requires our expertise to reach higher frequencies through customized solutions. Our standard hydraulic simulation table can achieve a frequency up to 100 Hz and well above when customized. This dynamic High Frequency Hydraulic Simulation Table is comprised of a platform that is as compact and light as possible and a base jig consisting of base plates on which stress-resistant hydrostatic jacks are assembled with rods jutting from the jacks connected to the platform structure. Both position and acceleration are controlled by the system through integrated control hardware and software. The Simulation Table can support heavy loads, while requiring only a minimum of space in your test lab.